Hey, hey! It’s the first review of Fantasy Month! So, I’ve been meaning to do a series review of the Lunar Chronicles since I devoured them a few months ago… and what better time than in the midst of Fantasy Month? After hearing people rave about this series for years, and then seeing several of the characters pop up multiple times in the Silmarillion Awards two years in a row, I knew I had to read them. I had actually managed to avoid reading any spoilers about the series! This series is a magically epic blend of fairy-tale retellings, fantasy, and science fiction, with action, adventure, humor, and a bit of romance. Each of these books has the retelling of a different fairy tale at its core. Cinder is, not surprisingly, a retelling of Cinderella. Linh-Cinder lives in New Beijing and is well-known as the best mechanic in the city. Unfortunately, she is also part cyborg (though she is human, she was in an accident when she was young and has a cybernetic hand and foot and eye) and that also makes her somewhat of an outcast. Cyborgs are not considered to be people or have rights to their own lives. Her step-mother is disgusted by the very idea of a cyborg in her home, and would throw Cinder out on the street in a heartbeat… if her mechanical genius weren’t the only thing bringing money into their home. But Cinder’s life changes when Prince Kai visits her booth and asks her to fix his android. Meanwhile, Levana, the Queen of Luna (the moon colony) has set her sights on marrying Prince Kai and becoming Empress, as well as Queen. The people of New Beijing specifically, and Earth in general, are understandably uneasy about the idea of this alliance between Queen Levana and their own Prince Kai, mostly because Lunars have a magical ability (called “glamor”) which allows them to distort other people’s brain chemistry. In short, they can make you see things that aren’t there, and even take control of your body and wield you like a puppet. I don’t want to give away too much more about the story, but suffice to say, that this is by far the most clever retelling of Cinderella I have ever read. All of the elements are there, but they are woven so seamlessly into the greater overarching story that you almost don’t notice the Cinderella story that is playing out on the pages. Cinder is an eminently likable character. She is neither plagued by the insipid personality nor the paralyzing self-loathing that has been a trend in popular YA literature in more recent years. While she has had a rough life and has been treated unfairly and has some doubts and self-consciousness about herself… these things are overshadowed by her skill as a mechanic, her practical nature, her ability to plan things out… but be impetuous at times, and her steady-as-a-rock moral compass. Even when you want to shout at her to RUN AWAY!!!! you can’t help but admire her for choosing the path that is best for the ones she loves, even if it will be detrimental to herself. I also love her friendship with Iko (an android with a faulty personality chip that makes her more human in her interactions… she reminded me of a female sort of Data from Star Trek: TNG) and how she treats everyone, from androids to princes, with the same respect, kindness, and decency. I’m gonna be honest right now. Scarlet was my least favorite of the books. This one’s core is Little Red Riding Hood, which is not my favorite fairy tale (I don’t have anything against it… I just wouldn’t list it among my favorites). The story follows Scarlet Benoit, who lives with her grandmother – an ex-military pilot – who has suddenly gone missing. (I don’t know why, but the whole “grandmother” part of the original story kind of went over my head for a while as I was reading the story). Scarlet is worried about her grandma, who has gone inexplicably missing. The police have been no help at all, as her grandma is known for being a little batty…. But then Scarlet meets a mysterious young fighter who calls himself “Wolf,” who seems to have knowledge of who kidnapped her grandmother and where they might be keeping her. Together, they set out to find her. There is a much stronger romantic element in this story, which I wasn’t a huge fan of. To be honest, my biggest complaints about this book probably stem from the fact that I didn’t want to get to know new characters… and I was far more interested in reading what was going to happen to Cinder next, and I felt a little gypped that Cinder ended on a bit of a cliff-hanger, and then this story opened up with all-new characters I was supposed to care about. Also, while Scarlet (the character) eventually grew on me later in the series, I didn’t really feel any connection with her or Wolf in this book. Meanwhile, back in New Beijing, Cinder is coming to terms with all the repercussions of thing she learned and did in the first book, and ends up teamed up with a man named Carswell Thorne… who I absolutely HATED on sight. Crescent Moon, Cress for short, is a young Lunar Shell (shells are people born on Luna without any magical abilities, and are also completely immune to Lunar manipulation) who has spent most of her life in a satellite orbiting in space. She is a computer genius and extremely capable hacker, and has been used by the Lunar Government to spy on Earth. However, Cress has seen the reality of her prison and dreams of journeying to Earth and walking in its forests. She sees it as the Promised Land, and so has begun to work quietly and subversively against her Lunar masters. Cress is my FAVORITE of the series, both her book and her character. Her story is that of Rapunzel locked away in the tower – and when we meet her, she even has extremely long hair – dreaming of a prince who will come rescue her. Socially awkward, epically hopeful, and adorable in every way possible, Cress is a character I could see myself being best friends with. And in this story, Carswell Thorne completely stole my heart. Because I got to see him through Cress’ eyes. And what’s more important… he gets to see himself through Cress’ eyes… and he realizes that he kind of wants to be the hero she thinks he is. The final book in the quadrilogy, Winter tells the story of fair Snow White… er… Winter… who is despised by her cruel stepmother (who is Queen Levana of Luna). Winter stopped using her Lunar ability years ago, after using it in a way she meant as kindness… only to discover months later that what she had been doing had been the ultimate cruelty. Unfortunately, Lunars who do not use their powers suffer the side-effect of going mad… Winter often sees things that do not exist… nightmares coming to life before her eyes. Winter is the most completely GOOD character in the story. In spite of being crazy, Winter is the epitome of selflessness. And just because she’s mad, doesn’t mean she isn’t clever… she is extremely clever. That doesn’t mean she always makes the best decisions, but she is not naive or stupid. She also has a core of strength like Wolverine’s adamantium skeleton… which is impressive. Winter was probably tied for second favorite book, because I loved Winter herself so much, and because the stakes were high, the tension was epic, and the conclusion…. !!!! Well, you’ll just have to read it for yourself. 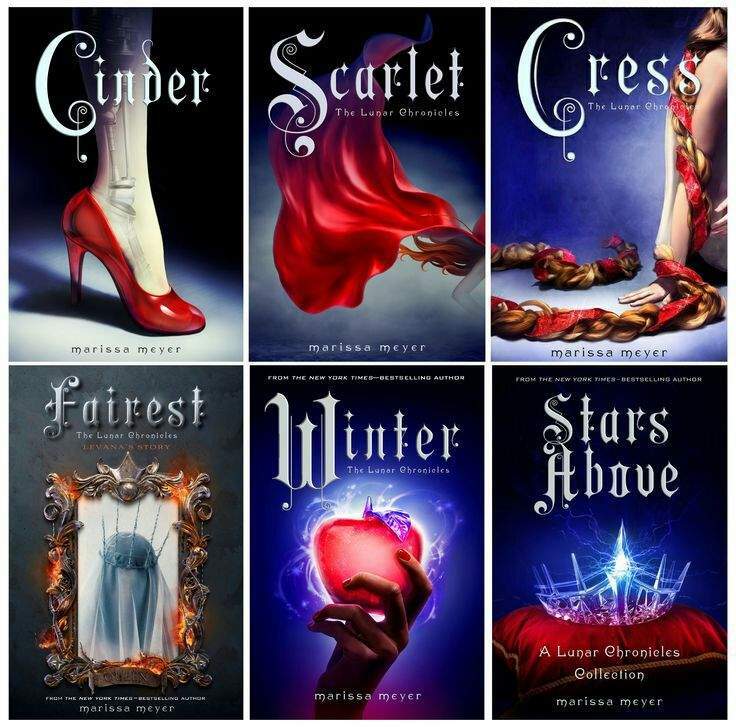 After I read the first four books, I went back and read Fairest. Technically a prequel to the entire series (and numbered as “Lunar Chronicles 3.5″), Fairest tells Levana’s story. It was a very unique read. A lot of times, when I read a book or see a movie from the villain’s perspective, or about their back-story, I feel like I come away with a sense that the author was trying to apologize for them… or maybe to them, for making them the villain. These stories often deteriorate into a sob-story about how it’s not the villain’s fault that they are this way, and if someone had just been nicer to them, then they wouldn’t have attempted to wipe out the inhabitants of Earth, or some such nonsense that blames their evil actions on something other than themselves and their own bad choices or sinful nature. Fairest does not do that. It was a very creepy, sinister, and somewhat chilling story to read. Because, while there were definitely parts to the story where I felt bad for Levana, or wanted to comfort her, or even felt like maybe I could understand her a bit… I never felt like the story was trying to justify any of her actions. It didn’t absolve her in any way for being cruel and selfish. The only place where it hints at that is when it talks about how Lunar children are not supposed to be subjected to “glamours” because it alters their brain chemistry in negative ways… and we learn that Levana’s older sister ignored this rule every chance she got. However, even that implication is so subtle that it never comes across as if the author was saying that it was the cause of all Levana’s choices. That it influenced her ability to have anything resembling empathy for another person… possibly. That it absolved her of any of her actions? Definitely not! Even though I knew where the story came in the chronology (and had already read how the series ended with Winter) Meyer did a phenomenal job building up the tension in this book. I was on the edge of my seat, terrified for the safety of everyone around Levana… even people I knew made it safely to the end of book 4! I thought that was an impressive feat of writing. I would say this was my 3rd favorite, after Cress, and my Cinder/Winter tie for 2nd. (Yes, I cheat horribly when I list favorite anythings). I loved this series so very much that I even grabbed a copy of the short stories that sort of wraps up the series… and I don’t generally like short stories very much. This collection is adorable and does a good job adding to the series without adding too much or telling too much or being redundant. I enjoyed the glimpses into the back-stories of many of my favorite characters… and how they fleshed out stories that had been mentioned casually in the series itself. And the final story was everything I wanted from an epilogue. And that concludes my series review. An epic series that jumped quickly up onto my list of favorites. I loved the cleverness, the way that the fairy-tale retellings were woven in so artfully, and yet how each story was new and different, in spite of (or perhaps because of) how these ancient stories made up their very heartbeat. If you have not read the Lunar Chronicles, I highly recommend that you do! Talk to me, dear Reader! Have you read the Lunar Chronicles? Did you like them? Which one was your favorite? Do you have a favorite/least favorite character? Let’s discuss!!! I. LOVE. THIS. SERIES!!!! It is sooo unique while at the same time having all the fun fairytale threads and such deep, wonderful characters and and and LDKJSLFKJLSJDLF. I am so in love! Cress is absolutely my favorite as well! (The person AND the book.) Annnd I actually loved Thorne from the start. *sheepish grin* What can I say? Those cocky, sassy guys in fiction always get me. But seeing his character arc in Cress just… *clutches heart* I CAN’T. IT WAS THE GREATEST. Winter herself was also SO PRECIOUS. Scarlet was my least favorite as well. I enjoyed it, but I liked the other characters and storylines better. BUT I JUST LOVED THIS WHOLE SERIES SO MUCH! I’m really happy you got to read them! I love this series, as well! I tend to be skeptical about things that take the world by storm, and have been disappointed before, but this series was everything it was cracked up to be and then some! I’m happy I finally got a chance to pick them up, as well! Definitely a new favorite! Will read these again! My biggest difficulty with Cinder was that I really couldn’t say much about her in this review without giving EVERYTHING away. And I really enjoyed reading the books without having any notion of what they were about – except for the few things I researched about Levana for the Silmarillion Awards. So, trying to do this as spoiler-free as possible…. which was a lot harder than I thought it would be! The first book… I absolutely fell in love with the characters and the world and just EVERYTHING! (I had only gotten the first one out of the library because I didn’t want to “commit” to reading the rest if I didn’t like the first one… because I tend to be skeptical of things that I deem to be “too” popular. But Cinder absolutely swept me away. I LOVED her so much. And Kai is just… he’s awesome. The first book was excellent!!! Which is probably why Scarlet was such a disappointment in comparison, because I was impatient with the idea of meeting a new character (I WANTED TO KNOW WHAT HAPPENED TO CINDER, K?! ), and I wasn’t expecting the story to start out with this entirely new cast… I probably should have seen that coming, but I didn’t. It wasn’t that I hated Scarlet (and the character grew on me… she was never my favorite, but I liked her fine by the end of the series, and now that I’ve gotten to the END with the final short story in Stars Above, I can even admit that she’s pretty cool and her story arc is adorable… but it took me that long to get there with her). I really wasn’t expecting for Cress to blow me out of the water. And I never would have guessed that I would absolutely fall in love with Thorne… and I think those things were what solidified my love of this series… but half the fun was in getting there… the characters grow and change so much, it’s pretty impressive. What I’m trying to say is… YOU SHOULD TOTALLY READ THEM!!! I really think you’d like them. You’re lucky about not being spoiled before you read them…I had the end of Cinder spoiled for me… But I still loved it despite that!! Yes, Cress + Thorne are my FAVORITES! Yeah, other than knowing rather a lot about Levana because I researched her for the SilmAwards, I managed to avoid reading any reviews and things before I read them… I’m glad I did.